Scene showing the Marine band on July 4, 1905. Marine on St. Croix in the 21st century looks very much as it did in the 19th century. Many of the Greek revival design structures built by the area’s lumbermen are still standing today, a testament to the New Englanders and Southerners who built them a century and a half ago. When the early settlers arrived the area was thick with sugar maple, oak, ash, birch, hickory, and many other species of trees. Just to the north, around Lawrence Creek, started the seemingly limitless pine forests of northern Minnesota and western Wisconsin. Marine Mills began in 1838 when Lewis F. Judd and David Hone, on behalf of a contingent of 13 men from Marine, Illinois, were sent to the newly available land in search of a good spot for a lumber mill. After staking a claim they returned to Illinois and in the spring of 1839, all but three of the company arrived with much-needed items in tow, including three oxen, two cows, and household goods. Among the company was Orange Walker, a tanner by trade, who hailed from Vermont and remained with the Marine Lumber Company for over 45 years. Others who became influential in Marine were Asa Parker, William Dibble, Hiram Berkey, Samuel Judd, George Judd, and Samuel Berkleo. With a muley saw and a flutter wheel in place, the mill began sawing that fall. During that first winter, 800,000 feet of timber were cut. Also during that winter, Orange Walker opened the first drygoods store. The settlement, first known as Judd’s Mills, was platted as Marine Mills in 1853. Over the years, business relationships between the original company members were dissolved and new ones formed. In 1863, Orange Walker became the Marine Lumber Company sole proprietor and, in 1866, he formed a new business, Walker, Judd & Veazie. Eventually the company would saw more than nine million board feet per year. In the late 1840s other settlers moved into the area from Ireland, Germany, England, and, mainly, Sweden. The immigrants focused on farming, and planted crops of wheat and rye. During the winters, many of the Swedish immigrants would help out in the pine forests or sawmills to supplement their small incomes. Due to the increasing amounts of grain being produced in Marine, James Gaskill, from Troy, Illinois, moved into the area and built a flour mill in 1855. A passable road from Stillwater to Marine was opened in 1841. The first government road, which ran from Point Douglas to Superior City on Lake Superior, was completed from Stillwater through Marine in 1853. 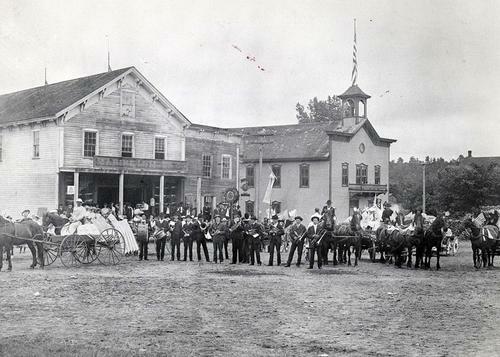 In 1853, four-horse coaches made their first appearance on village streets. In 1856, another mode of transportation was brought into Marine: the Marine ferry, the only means of crossing the St. Croix River between Osceola and Stillwater, was operational for 100 years. Over subsequent years, businesses were established to accommodate the settlers and those in the hinterlands. There was a hotel, blacksmith shop, company store, general store, brewery, and café, among others. The first school house was constructed in 1853. In 1964, residents established the Marine Restoration Society with the purpose of maintaining the historic and nostalgic feel of Marine. In 1998 Jackson Meadow, a new residential neighborhood, was built with in the city limits. Homes occupy on only one-third of the site; the rest is open space. Currently, Marine on St. Croix is home to about 650 residents who treasure the charm of their community. The town square, with its general store, town hall, library, ice cream shop, bank, and café, give the downtown area the look of a New England village. A charming post office, the stunning Christ Lutheran Church, the historic 1872 Stone House Museum, and a restored Swedish settler’s cabin add to the charm. The original mill site south of the Village Hall has been declared a state historic site. Marine Township was organized on October 20, 1858, and absorbed Vasa Township in 1860. It was incorporated in 1875. Marine Township included May and New Scandia townships until 1893, making it the county’s largest township. The village was officially renamed Marine on St and incorporated in 1950.